Cross-posting this piece by Emil from A(s)cene. Taylor’s coral reef art is beautiful. See also the discussion of Donna Haraway’s “String Figures” lecture and Bruno Latour’s 11 theses on capitalism. Last week, Lee led us through an exercise that helped to contextualize the minuteness of the period in which humans (and modern life on Earth) have existed. Dovetailing off of Haraway’s talk on the Anthropocene (or perhaps Capitaloscene) and her use of visual media and aesthetics to conceptualize and re-conceptualize the term’s significance, this week we will be exploring various aesthetic and artistic interpretations of the Anthropocene (although many of the images may not be constructed by self-proclaimed ‘artists’). There are some interesting works here, as well as in Making the Geologic Now, which we briefly focused on at the beginning of the semester. I’d like to draw attention to the living sculptures of Jason deCaires Taylor, an artist and coral reef advocate based out of Cancun, Mexico. Opposing the capitalist “land as commodity” paradigm, Taylor subverts the resource-as-value mentality by installing art pieces, whose inherent value to humans is not economic, but artistic, that actively proliferate life on their structures. 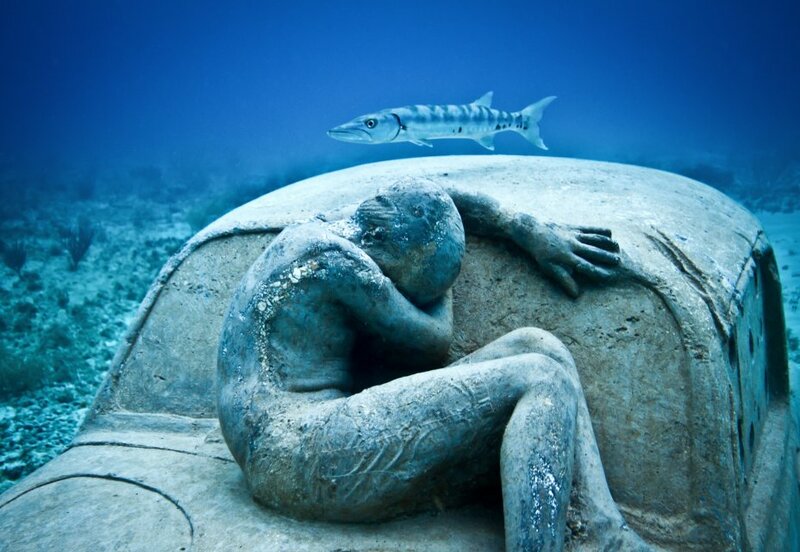 Taylor’s sculptures, which are composed of ph-neutral, environmentally friendly materials, are not just an interpretation of the world, that is a medium for-us, but rather an artwork acknowledging our large-scale presence that also seeks to heal the world’s depleting reefs – a medium for-them. With scientists estimating that 80% or more of all reefs on Earth will be lost by 2050, Taylor aims to decouple us from the notion that it is our vulnerability at stake in the Anthropocene. Yes, as Nigel Clark argues, we can succumb to this inhuman nature that is entirely indifferent to preserving our lives, but as Taylor wishes to show, so are the coral reefs. 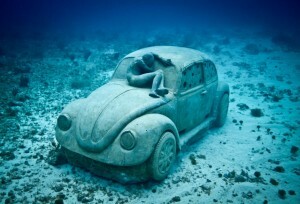 In Taylor’s piece intitled Anthropocene, an old VW bug is submerged on the ocean floor supporting a fossilized child who appears to be asleep. 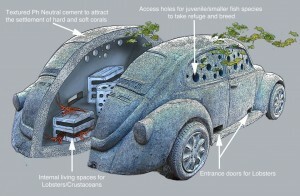 The sculpture is hollow with various openings close to the floor, allowing lobsters to make their homes in the structure. I wonder if these crustaceans symbolize the ancient beginnings of life. In another piece entitled The Silent Evolution for which he received critical acclaim, Taylor took casts of over 400 humans and installed them in an area over 420 square meters in size. While this underwater society appears human at first, it is imperceptibly transformed into a marine assemblage until it is no longer familiar to us. Taylor’s installations remind us of our simultaneous vulnerability (ala Clark) and our unique human qualities, like our capacity to both destroy life and to engender it. As an aesthetic medium, we are invited to explore the ocean floor and discover these strange objects that evolve over time. Almost a kind of wild Banksy, Taylor plays off of our land-evolved eyesight, drawing our attention to the new ways that light refracts, and colors/perspectives appear underwater. Thank you a lot for providing individuals with an extraordinarily marvellous possiblity to check tips from this web site. It really is so beneficial and as well , stuffed with a good time for me personally and my office co-workers to search your web site not less than three times in one week to learn the new items you have got. And lastly, we’re at all times amazed with the impressive pointers you give. Selected 2 tips in this article are rather the most effective I have ever had.